Young canaries happily learn songs that sound nothing like their species, but they revert to a strict canary-like melody as they mature, Science reports. A US team was surprised to find it could teach juvenile birds a haphazard jumble of computer generated tunes. However, the birds' impressive flexibility gave way to rigid rules when breeding became a priority. Paradoxically, months of wayward early learning seems to have little impact on the birds' ability to sing properly. The scientists hope this puzzling course of events will help them understand how birds develop songs. "The most surprising thing is that the birds were able to imitate, and then paradoxically they abandon this imitation in adulthood," said co-author Tim Gardner, of Rockefeller University, US. "It seems an excessive capacity for imitation, which is dropped when they grow up." Young canaries apparently learn their songs by closely copying a nearby adult, a laborious process that usually takes between six and eight months. In order to test how flexible their approach to learning is, the US team exposed young male canaries to computer generated tunes that did not follow any of the standard canary-song rules. The team found that the youngsters picked up the foreign tunes and reproduced them with enthusiasm. But then something rather strange happened. 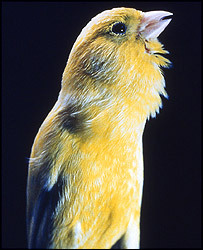 As soon as the canaries received a pubescent surge of testosterone, they dropped all the incorrect lessons they had learned and started singing traditional canary songs. Even canaries that did not get to imitate any songs at all developed the proper tune as adults. Counter-intuitively, although they spend a long time labouring over new songs, listening carefully, imitating and perfecting, young canaries do not actually seem to need it. Once adult, they can sing just fine without it. "We don't have a full answer for this," Professor Gardner told the BBC News website. "But birds that go through this period of imitation might have a richer repertoire of syllables so the interaction between this early freedom and the later rules ends up creating a more diverse set of sounds in adulthood." In other words, although the birds who sang nonsense as juveniles sound perfect to the human ear, they might not sound quite so good to the canary ear. The real test, according to Professor Gardner, would be whether or not females chose them as mates over birds that grew up with more conventional lessons. It might seem odd that young canaries are so extremely flexible when they are first imitating sounds, especially since the adult song is pretty rigid, but Professor Gardner believes it could be important. "It may be that imitation requires this kind of freedom," he said. "The neural pathways involved in learning might actually require that degree of freedom in order to accomplish learning."